Knorr knows that preparing deliciously wholesome soups is only possible when the vegetables and spices are grown from a good foundation of sustainable farming that cares for the soil, enabling it to be fertile for years to come. Unleash your creativity and rally people to take action and support Knorr’s fight for better soil, and help Knorr bring tastier and more delicious soups to everyone’s tables. 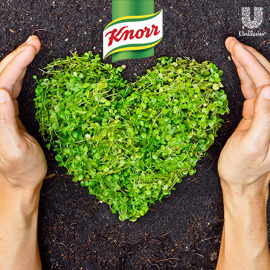 Turn Knorr’s “Love the soil” campaign into a movement that everyday people will participate in and support, just like in the Ice Bucket Challenge. Format: Presentation with visuals and text (maximum 3 pages PDF). Submit your entries before 1st November and win prizes up to 5,000€. All the best!